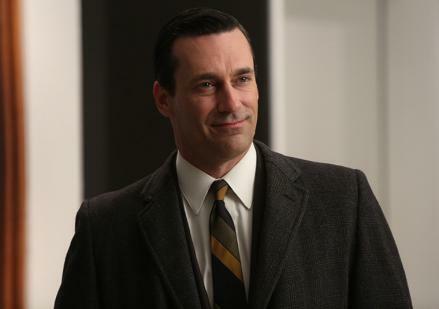 Mad Men season finale recap: In Care Of, final episode of Season 6, reviewed. Has Don found a way home? The opening scene saw Stan making his pitch to Don that he should be on the Sunkist account and open a Los Angeles office for the agency, and the “California Dreamin’ ” theme permeates the episode. Don at first derides L.A. as “Detroit with palm trees,” but he is shortly stealing Stan’s idea, literally plagiarizing Stan’s pitch when he tries the idea out on Megan. For Don, escaping to L.A. is a way of drying out, and starting again with his second wife. But the California fever spreads fast, and pretty soon everyone needs to escape. Ted is desperate to get out there so he can put 3,000 miles between him and Peggy; Pete wants to go because he was so humiliated in Detroit. For Stan, this was a Beach Boys moment, but for the rest of them, it’s Joan Didion I hear in the background, warning about the illusion of the golden dream. I remember Matthew Weiner saying early on, “This whole season is about an attempt to deal with returning to your basic problem, which is that you are you.” Ted has a chance to redeem himself out there, but do any of us doubt that even under those palm trees Pete will always be Pete? The possibly deceptive dream of L.A. ties into the larger tension between roots and freedom, the comfort of family and the possibility of starting fresh. This theme was especially poignant in Ted and Peggy’s condensed affair. (Peggy, by the way, apparently wore pants in the office for the first time in this episode, perhaps to make up for the fishnets and cleavage she strutted around in earlier.) Ted promises Peggy that he will leave his wife, and while she shushes him at first, she clearly buys it: She will wait, she says—she doesn’t want to sneak around and she doesn’t want scandal. But it takes only one domestic cuddle for Ted to realize he is fooling himself. “I wanted this so much, but I have a family,” he tells her. “I have to hold on to them or I’ll get lost in the chaos.” The consolation prize, he tells Peggy, is that she can have her life, be free, build her career. But Peggy doesn’t want the freedom. “Aren’t you lucky to have decisions,” she tells him bitterly. Pete echoes Peggy’s ambivalence when he stops by Trudy’s house. Up until that visit Pete has had nothing but stress and trouble. Bob Benson unmanned him at Chevy by forcing him to drive a stick shift, which ended with Pete knocking down the GM sign. Pete also found out that Manolo married his mother on the aptly named SS Sunset Princess and that his mother went missing. But instead of trying to chase and prosecute Manolo, Pete has decided to go west. “You’re free,” Trudy tells him. “Free of her, free of them, free of everything.” Even Pete is not so delusional, though. “That’s not the way I wanted it,” he says, before a rare tender scene with his daughter. All season long Don has been threatening to go rogue at a client meeting, showing an ad that he didn’t realize looked like a suicide scene in the first episode, putting Ted and Peggy on the spot last week, and generally making everyone uncomfortable. This time he actually did it, in one of the more spectacular office scenes in Mad Men history. Without changing the tone of his voice, or the strained look on his face, Don confessed his true, sordid history to a room full of colleagues and Hershey execs. After selling them a story about how his father used to take him to the drugstore after he mowed the lawn and give him a Hershey’s bar and tousle his hair, he suddenly pivoted and told them the truth. The story Don sold at first is not far off from what Hershey’s commercials of the era looked like. But the true story, the one he told second, is much more powerful. And although it makes the executives squirm and gets Don fired—or suspended indefinitely—the story does work a kind of magic. A show with two evangelists and a few Thanksgiving dinners can’t help but take a turn toward the redemptive, perhaps. Don finds his escape, not in L.A. but in the truth. In the end he does the right thing and lets Ted go to California, and he takes Sally and the boys to the crumbling Amityville horror house that was his childhood “home.” In the last shot, Sally—who in the episode with the apartment intruder complained that she doesn’t know anything about her father—gives him a knowing look. So, what did Bob Benson know? Also, what do we make of Pete’s mom dying at sea given the myriad water metaphors this season? And what happens to Don now? Does he start making anti-Nixon ads? Eventually find his way to A.A.?